When I set out to build a portable telescope, known as a Dobsonian telescope, the first step had me stymied—where do you find 6 ft of 8-in.-dia cardboard tubing? I’m a physicist by training, an amateur astronomer by inclination and an occasional visitor to the home center for DIY projects. A massive tube is not usually on my shopping list. I stood in the store with meticulous notes on the materials I needed, but no one could find them. "Um, I think it might be called Sonotube," I repeated, until someone pointed me toward the concrete form tubes in the garden area. And no, my local hardware store did not carry Teflon. I had heard that building a Dobsonian was simple and inexpensive. This is in fact true—but collecting the materials takes some doing. This is a far cry from John Dobson’s experience when he first built the portable, sidewalk telescopes that now bear his name. "We were just scroungers," he tells PM. "The whole thing was made out of junk. The cardboard tubes were lying around. The shingles used to mount the mirror were blown off roofs in storms. We built the mount from window cutouts from schoolhouse doors that had been thrown away." At age 91, Dobson is as passionate about building inexpensive telescopes as he was when he built his first one in 1956. When I brag that the plastics supply store where I finally found Teflon gave me some scrap for free, he exclaims, "Good for you!" I did not admit to him that I didn’t grind my own telescope mirrors—something he did with two porthole windows and sand paper—and that I didn’t build my own eyepiece out of binoculars. (Optics these days can be purchased in kits online.) Nonetheless, the instructions I used were very similar to Dobson’s original Plans for Building A Sidewalk Telescope. I based my design on the telescope plans provided by Ray Cash, a member of the San Francisco Sidewalk Astronomers, modifying the plans even further with a few ready-made parts. 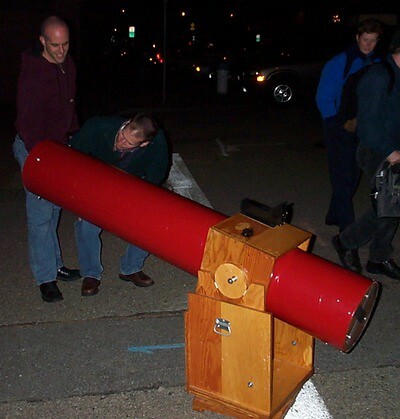 Dobson claims he didn’t invent the sidewalk telescope, as he had lots of help with his early prototypes. However, Dobson did choose to promote his sidewalk telescopes at the cost of his longtime home. After 23 years living in a Vedanta (a branch of Hinduism) monastery, where he built telescopes surreptitiously in the basement and then snuck out at night to introduce the neighborhood kids to the stars, he was told he had to choose between life as a monk or as a telescope builder. That was in 1967. Today, Dobson still tours the world to teach telescope building. The collection process turned out to be an enjoyable treasure hunt—but don’t worry, the source list we put together below explains how to find everything. As I sawed and drilled, I murmured a fairly steady mantra to myself of "Why on earth do I have to do that? Oh. Wow. That’s brilliant." The design isn’t intuitive or obvious, but it is wonderfully elegant. In essence, it’s a telescope built onto a gun mount, which balances through friction as it swivels on an LP record. My total cost was around $400. You may be able to buy a similarly sized commercial telescope at that price these days, but you wouldn’t have nearly as much fun. The actual construction took a weekend, and it would be a great project to tackle with kids. Dobson may be nonchalant about how he used only junk to build his scopes, but it took an impressive mind to figure out how to use that junk in such ingenious ways. Building my telescope, watching it swivel so smoothly, seeing the stars, I basked in the reflected glory of that ingenuity. I am hooked. I want to build another one—and next time, I’m going to grind my own mirrors. It started in San Francisco with the Sidewalk Astronomers. Find yourself an astronomy club where you are and get into it. This is the International Year of Astronomy. What have you done so far? This entry was posted on Friday, September 18th, 2009 at 7:48 pm	and is filed under Space Tourism. You can follow any responses to this entry through the RSS 2.0 feed. You can leave a response, or trackback from your own site.